Inset cabinets are not as tolerant as the standard overlay. Since doors and headers are crafted to fit inside the frames, with tight and consistent tolerances, inset cabinets are very vulnerable to dimensional changes and racking out of square. When such things happen, inset doors and headers can bind, sometimes to the point of ceasing to function at all. Standard overlay cabinetry is, by its nature, forgiving. Because doors and headers overlay the face of the frame, a significant degree of dimensional change or racking of the frame can be tolerated, while still providing full function of the cabinet. Our inset offering is similar to our overlay offering, with the same lead times, but with some minor differences. Inset cabinetry is offered in all standard and rustic woods. 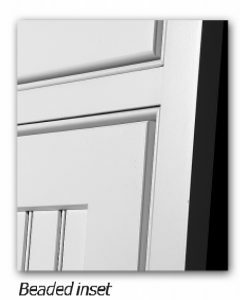 All our available finish choices are available in inset. Almost all our accessories and modifications are available in inset. Some specific cabinets and interior accessories are not compatible with inset construction and are not in the offering. For example, only flat valances are available for inset. Inset wall cabinets are 13″ deep, and can be ordered 14″ deep at no additional charge. Since the door is inset in the frame, this additional depth makes up for interior space that would otherwise be lost. 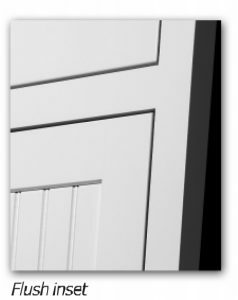 Full-extension soft-close guides are standard with all inset cabinetry. Slab, five-piece and SRDE headers are offered. Drawer openings are larger, with 5-1/2″ standard for top drawers. Inset orders also have a choice of hinges.The three-way-adjustable soft-close concealed hinge option creates a cleaner look. The exposed finial hinge has a more historic character, and is offered in three metal finishes. Final hinges offer limited adjustment. A beaded or flush inset frame can be specified with all inset cabinetry. A gap of approximately 3/32″ will exist between frame members and doors/headers. Changes in humidity and temperature can cause this gap to change over time. This is normal and expected. What is cabinet racking and how to prevent it? Racking occurs when a cabinet is forced out of square by improper installation. Any inset cabinet, from any manufacturer, can be racked to the point of being nonfunctional if it has been poorly installed. This is a bigger issue with base cabinets forced to conform to uneven or out-of-square floors and walls. But racking can also happen to any other inset cabinet. To help prevent racking, almost all our inset base cabinets have a full top for added rigidity. But even with this extra strength, it is so important that inset cabinets are installed with extra care to avoid applying the stresses that cause racking. Dimensional changes occur mainly when environmental temperatures and humidity are not controlled within an acceptable range. It’s the nature of wood to expand and contract with changes in temperature and humidity. This simply can’t be avoided. Therefore it’s vitally important that inset cabinets are never in an environment where temperature and humidity go to extremes. This applies to where and how cabinets are stored prior to installation, as well as to the conditions within the location where the cabinets are installed. If you live in an area where interior temperature and humidity can be expected to vary in the extreme, we do not advise selecting inset cabinetry from us nor any other manufacturer.